Let’s face it: New York City knows how to do the holidays like no other city in the world. Even before the first snowflakes fall, the city transforms into a magical winter wonderland. Skaters do figure-eights in Central Park, the Rockettes kick up their heels at Radio City Music Hall and Sugar Plum Fairies drift across the stage at Lincoln Center. So if the Big Apple is beckoning you this holiday season, here are a few things you might want to put on your to-do list. See the Holiday Lights during Christmas in New York City. Just book a NY SEE THE LIGHTS! Tour during the holidays and you’ll see New York City at its finest. 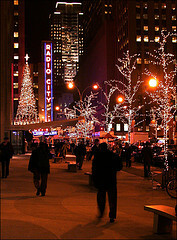 Get more information about our NY SEE THE HOLIDAY LIGHTS! Tour here. – Sidewalks come alive with street performances by musicians, jugglers, stilt walkers and much more. – Angels, snowflakes and fairies galore prance delicately across the Lincoln Center stage in a show that delights children and adult alike. Stop by the Grand Central Terminal for a warm and festive holiday shopping spree. The annually held Holiday Fair offers fun and original gift ideas and a merry atmosphere. The West Side Lincoln Square neighborhood changes drastically during Christmas in New York City into a gorgeous winter wonderland with a tree lighting in Dante Park, activities for children and adults alike, street performers, music, food and more. See the 5th Avenue Window displays on the NY See The Holiday Lights! Tour. The New York Transit Museum Gallery at Grand Central Terminal is returning with its 8th annual Holiday Train Show which features a full train track with a fully functioning train and miniature New York City background. The vintage trains made by Lionel, American Flyer and Louis Marx & Company, which date as far back as the 1920’s, will also be on display. The New York Botanical Garden’s Holiday Train Show is a beautiful scene of The Big Apple built entirely out of plants and natural material like seeds, bark and leaves. A few of the included landmarks are the Brooklyn Bridge and The Statue of Liberty constructed by Paul Busse. The miniature trains are also incredibly impressive works of art to view and run the familiar New York City Landscape. Wild Holiday Party and Presents to the Animals– The inhabitants of Central Park Zoo unwrap scrumptious snacks as onlookers watch in delight. The Medieval Sculpture Hall at The Metropolitan Museum of Art is hosting its annual Christmas tree revealing which features a gorgeous tree trimmed and decorated with 18th century ornaments and a beautifully detailed Neapolitan Nativity scene. The event will also include festive décor and seasonal music. Central Park Holiday Lighting– Crafts, carolers, cookies and hot chocolate surround the holiday lights in Central Park. Hanukkah in New York City– The eight-day Festival of Lights begins on December 21, 2008. Rockefeller Center Christmas Tree Guide– December 3, 2008 from 7-9 p.m. This is a must if you are spending Christmas in New York City. Soon enough, the bright lights of New York City are going to be drowned out by the beautiful lights of the holiday. The South Street Seaport is kicking it off with a traditional tree lighting ceremony where a 50 ft. tree will be lit up the day after Thanksgiving and will also feature carolers and surrounding holiday shopping. We hope that this page has helped you plan your stay during Christmas in New York City.